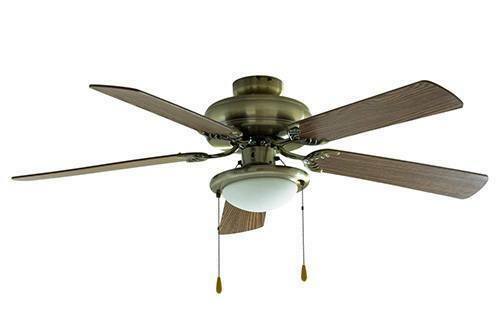 If there is one appliance that any homeowner should have, it should be a ceiling fan. Apart from the aesthetic value, it can bring to your home with modern ceiling fan designs, the energy savings is just difficult to ignore. In essence ceiling fans are a practical solution to maintaining a comfortable temperature of any room in your house plus much more! The only thing that probably kept some homeowners go for ceiling fans is the perception that it would be difficult to uninstall them when they malfunction or they just go out of style. The question “how to remove a ceiling fan” would definitely cross anyone's mind. Removing a ceiling fan is actually not as difficult as what you think it is going to be. You will just have to know what type of ceiling fan is it that you have. Is it a flush-mounted or a ball-in-socket ceiling fan? When you have answered such question, it would be easy to identify what steps to follow. A flush-mounted type is where the motor fan is sitting on top of the fan blades and is mounted straight to the ceiling. Ceiling fans of this type are appropriate when the ceiling is around eight feet high. Ensure that electric switch is turned off. Like any other electrical-related tasks, safety comes first. Turn the power source off. Double check if the correct power source has been turned off by turning on the fan. If it remains static, of course, that would mean it is safe to move to the next step. Warning: Take note that the fan wires may be connected to more than one circuit. Uninstall the light dome cover. Uninstall the light dome if the fan has one. This can be done by twisting the dome counterclockwise. Assess if you need an assistant or not. Unscrew the cover carefully and hand it over to your assistant. Disengage the light assembly. So, before you can take the assembly out, you will need to unscrew each of the parts in the following order:Light bulbsCeiling fan bladesLight kitTake the light bulbs by simply turning each in a counterclockwise direction. When you are done with the bulbs, the next thing to remove are the fan blades. Metal brackets are the holding the fan blades and the fan’s body together. To keep the task quick and simple, the best thing to do is just to detach the metal brackets from the fan’s body rather than taking each of the blades out. This will save you time because you will just deal with fewer screws.In detaching the light kit, you will have to lower the kit down, enough for you to have easy access to the wires which connects the assembly to the fan. Loosen the wire caps and be sure not to touch the uncovered wire in the process. Test the wires with a circuit tester. Before moving on to the next step, ensure that there is no electricity. Detach the fan motor. Locate the wire that connects the motor to the switch. Loosen the wire cap and detach the wire. In most cases, you will encounter a black wire and a white wire. When the wires are disconnected, you can get the fan motor by tilting at the same time lifting so the motor is completely detached from a small hook. Take the mounting device out. The mounting device is screwed to the ceiling. You can take it off by removing the screw. Once done, make sure the wire connection from the breaker to the ceiling fan is well insulated. Ensure that electric switch is turned off. Safety is very important, especially when dealing with electrical. You can go to where your circuit breaker is located and switch the appropriate breaker off. 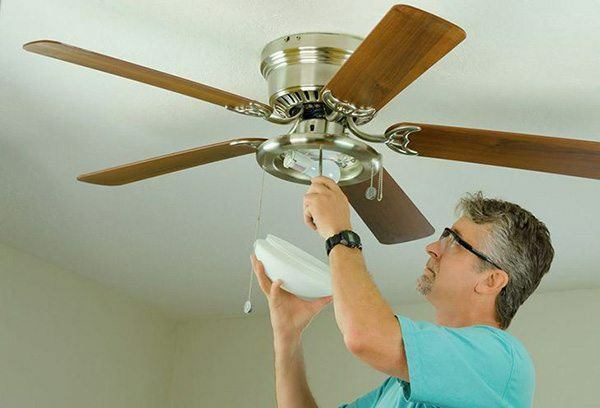 Before starting the fan removal, try turning the fan switch on to ascertain if you have turned off the right breaker or you can check it with an electrical tester.Get the ladder and set in position. Do this in a manner that you can easily reach the paddles to the wire cover plate. You cannot do this when the fan is just above your head.Take the bulbs out. In case your ceiling fan has light bulbs or any other adornments, it is best to detach them before you detach the fan to secure them from breakage or damage. With the light bulbs, all you need to do is turn the bulb counterclockwise. Some other adornments are screwed so you’ll just have to unscrew them.Remove the canopy. The canopy is the housing cover you find at the topmost portion of the fan that is almost attached to the ceiling. Get a mid-sized screwdriver. Loosen the screws to take the housing cover out. Usually, there are three screws and when these are taken out you will notice that the plate is not completely detached. This is because of a small hook that also secures the plate. All you need to do is lift the plate up and it’s unhooked. You can then let the canopy slide to the fan.Detach the electrical wires. Since the cover plate or housing cover is down, you can clearly see the electrical wires. One by one, deal with each wire carefully. Find where the wing nuts are and loosen each of them. Slowly pull the individual wires. After doing so, work on the ground wire. This wire is usually connected to the bracket that's on the ceiling. Unfasten the wire with your screwdriver or pliers whichever is more appropriate.When all the wires are disconnected from the source wire on the ceiling, make sure to secure the caps back to the source wires. This is a safety measure to avoid accidents when you put the power on or if you install the fan back after cleaning or repair. The wires should be steadily covered.Detach the fan. The cover plate is out and all the wires are disconnected. It will be easy to take the fan out. The metal suspender of the fan or the mounting bracket has an opening where the ball socket goes in and out. Slip the ball-in-socket or ball hanger out.Bring the fan down. Be sure you have a good hold of the fan. You may ask somebody to assist you in this step or if you can’t find any, regain a good hold of the fan by resting some of its weight on the ladder top. Adjust your grip and bring it down.Take the mounting bracket out. If your fan is beyond repair or if you have a new ceiling fan to be installed, you will need to take out the mounting bracket. Get a screwdriver to loosen and completely remove the bracket and you are done! 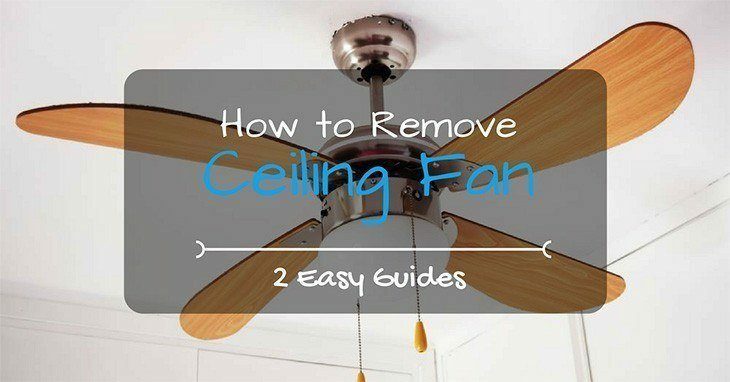 Regardless of the type of ceiling fan you have, you can see from the procedure shown above that removing an old ceiling fan is not that complicated. All you need to do is to perform the each of the steps with great care. I hope you find the procedure helpful. Should you have doubts, do send me a note and I will respond right away. Warning: If you are not confident that you can do it on your own, an assistant surely will make the job easy and fast!